High Quality Content by WIKIPEDIA articles! The Rhone, formerly known as Gilroy, was a 1,768 ton, iron sailing ship with a length of 259.2 feet, breadth of 39.9 feet and depth of 23.2 feet. The Rhone was built by John Elder of Glasgow, Scotland in 1875 for Gilroy, Sons & Company of Dundee. The Nourse Line bought the ship in 1889 and renamed it the Rhone after the River Rhone. She was primarily used by the Nourse Line for the transportation of Indian indentured labourers to the colonies. She was also used to repatriate 132 former labourers from St Lucia back to India. 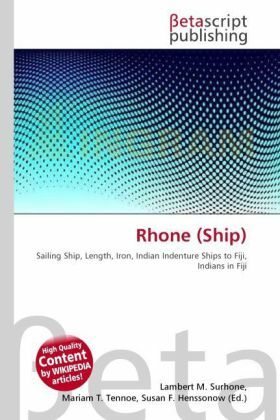 The Rhone was regarded as a fast ship. She made the run from Trinidad to Cape Town in 45 days and on 4 November 1894 travelled to Gravesend from Trinidad in just 24 days.